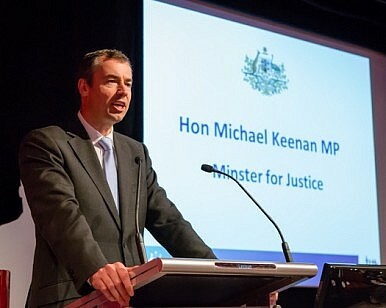 Australia's minister for justice Michael Keenan. Thailand and Australia plan to sign a new anti-terrorism pact amid rising concerns about the Islamic State in Iraq and Syria (ISIS) in the Asia-Pacific region, the Southeast Asian state’s defense minister said Friday. Speaking after meeting visiting Australian justice minister Michael Keenan, Prawit Wongsuwon, who is also Thailand’s deputy prime minister, said that the two countries were working toward a memorandum of understanding on anti-terrorism cooperation, which will be signed soon. “Our cooperation [with Australia] will be strengthened and a memorandum of understanding on anti-terrorism cooperation will be signed with Australia. However, discussions over the details must be carried out first,” he said. Prawit said that his talks with Keenan, who is also the minister assisting Australia’s prime minister on counterterrorism, had centered on transnational crime, narcotics and terrorism. Keenan also met with other Thai officials, including his counterpart Paiboon Koomchaya and the deputy national police chief Srivara Ransibrahmanakul. Australian officials have been concerned about the rising threat of ISIS to the region, especially after bombings and gunfights in the Indonesian capital of Jakarta on January 14, which killed eight people – including the four attackers – and injured dozens (See: “Islamic State Attack in Indonesia? A Look at the 2016 Jakarta Bombings”). Ahead of the January attacks, analysts warned that the ISIS had identified Indonesia as a location for a “distant caliphate” as it seeks to expand its reach into Southeast Asia (See: “Islamic State Eyes Asia Base in 2016 in Philippines, Indonesia: Expert”). As for Thailand, Thai authorities have been emphasizing that ISIS does not currently have a presence there, and that a Malay-Muslim insurgency raging in the country’s south is a separate issue. Nonetheless, with over 100 Australians estimated to be fighting with ISIS and some 800,000 visiting Thailand each year, Keenan acknowledged that Thailand could be used as a transit point by Australians looking to travel to the Middle East. To mitigate the ISIS threat, Keenan said that Australia was ready to share its experience with regional governments, including Thailand, to facilitate cooperation. “If we can make those relationships stronger then we should seek to do so, because this menace is going to be with us for some time and the more we can do to collaborate, to address it, the safer our people will be,” he said in Bangkok. During meetings with Keenan, Thai officials reportedly sought Australian assistance in providing technology and equipment to help investigate bombing cases. In August 2015, a deadly bomb blast rocked Bangkok, killing 20 and injuring 25 in one of the worst attacks of this kind Thailand had experienced in recent memory (See: “Interview: Analyzing Thailand’s Erawan Shrine Bomb Blast”). Last week, Australian Prime Minister Malcolm Turnbull also met with U.S. president Barack Obama, where the two leaders discussed the Islamic State and counterterrorism cooperation among other issues. Islamic State Eyes Asia Base in 2016 in Philippines, Indonesia: Expert Interview: Analyzing Thailand’s Erawan Shrine Bomb BlastConfronting Threats in the Sulu-Sulawesi Seas: Opportunities and ChallengesThe Other Sea That Dominated the 2016 Shangri-La DialogueIslamic State in Thailand: A Phantom Threat?